Happy Monday everyone.. 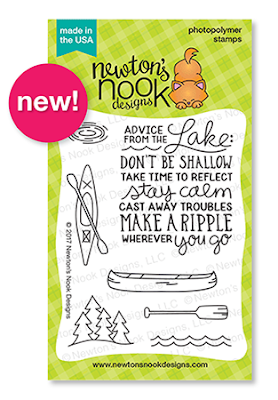 It's time for the July Release from Newton's Nook and this Month it's Newton's 4th Birthday!!! So we have a huge release and a Fun Blog Hop on Friday with lost of prizes, so stay tuned all week!!! I'm so excited about the stencils.... Be sure to watch my video at the end of this post where I share some fun techniques on how to use these stencils to create backgrounds and stay tuned all week to see how I used them in my projects!! I started with a piece of Bristol card stock and I added some Tumbled Glass Distress ink along the top to create a sky. Then I stamped some of the trees from the Whispering Pines set to create a forest look. 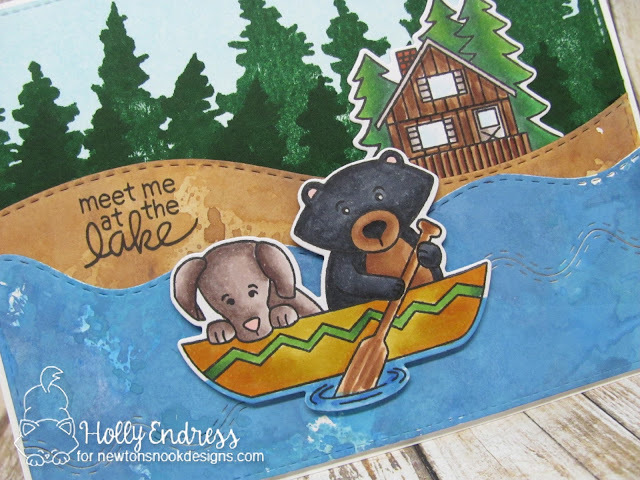 I used the Landborder die to create a bank along my river and I used some Vintage Photo Distress Oxide ink to color it in. 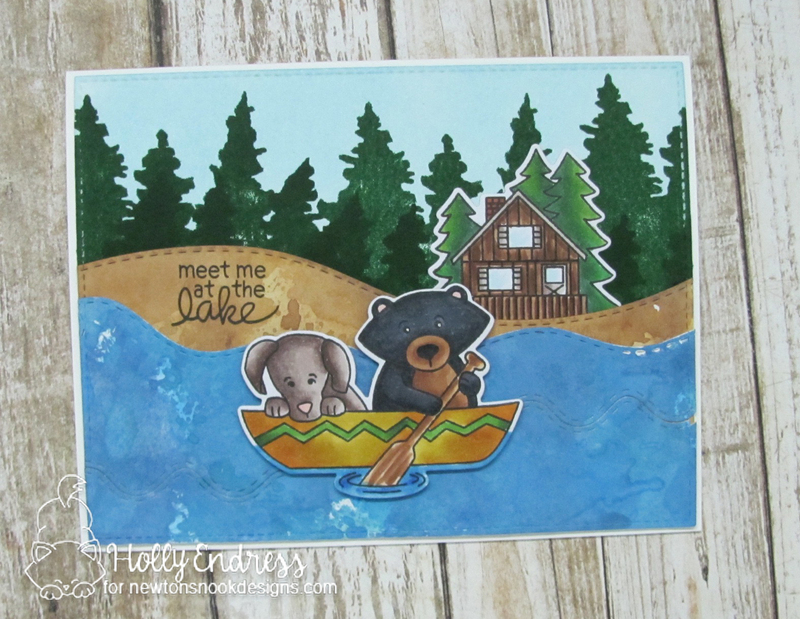 I used the new Sea Border Die to create my Lake and I colored that with more Distress Oxide inks. Then I added some waves with the Sea Border die as well. I stamped the images from Winston's Lake House onto some X-Press it blending card stock and colored them in with copics. Then I used the coordinating dies to cut them out. I stamped the sentiment along the edge of the bank. 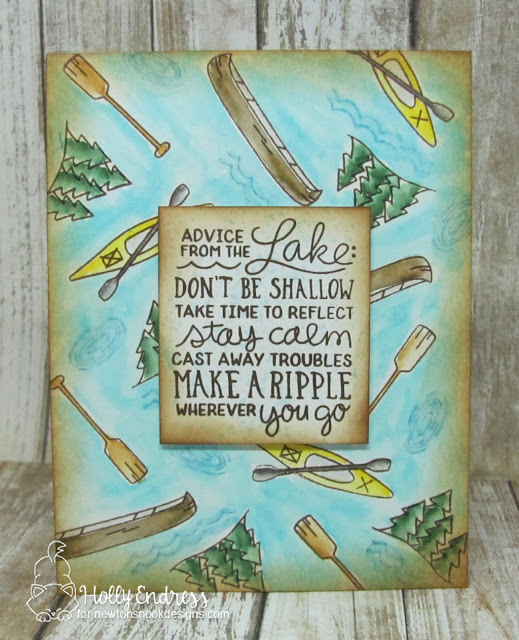 My second card uses the Lake Advice set... This set has some fun images in it that makes it perfect to create your own background. I stamped all the images onto some watercolor paper with Archival Brown ink and then I colored them loosely with Zig Clean Color Real Brush markers and a water brush. I stamped the water ripple and wave in Distress ink and blending it out a little. I adhered the base to an A2 size card base and then I added some Vintage photo around the edges. 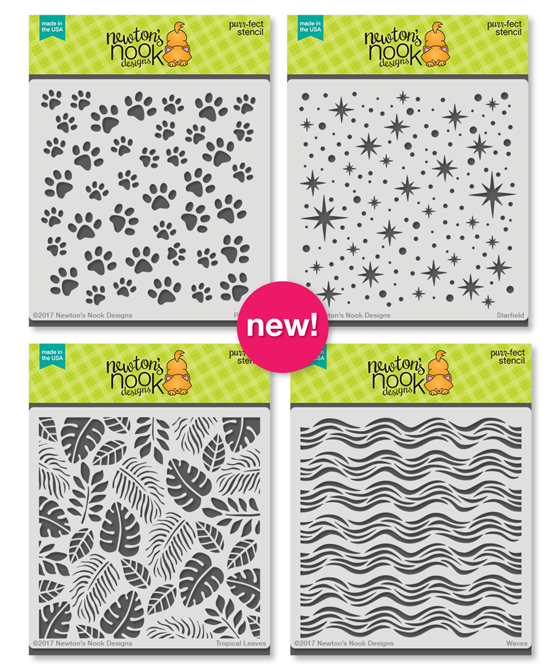 Would you like to win a $20 store credit to Newton’s Nook Designs? ONE lucky comment will be chosen from each reveal day to win! Comment on the NND blog and Design Team blogs (see list below)! The winner will be chosen at random from the collective reveal posts. Make sure to check out each of their blogs and comment for your chance to win. You will not know which blog has been chosen so the more you comment on the better your chances are of winning! You have until Thursday July 15th at 9pm CST to comment -- winners will be announced on the blog post on Friday, July 16th. Your cards are adorable! Love the background you stamped on the second card. 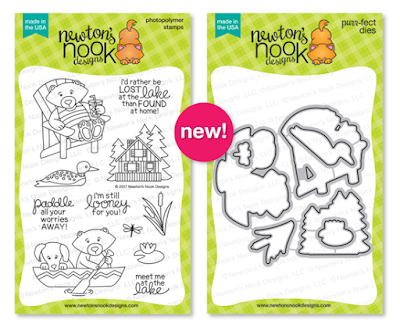 The video was fantastic at showing all the fun ways to use the stencils. Thanks for sharing! I just love the great way you colored the lake with Winston in it and the fabulous background you did for the Lake Advice! These are gorgeous! Thanks for the video tips for stencils, too. Great ideas. gorgeous cards :) love the aged look on the second one, so pretty! Great cards. Love this new collection. Wow Holly your card are amazing! The scene card of the lake is just stunning, love everything about it, so creative. The second card is also great, love the colours and how you stamped the images all over, the colouring is fantastic. I really enjoyed your video, you shared so many amazing techniques using the stencils. Both card are awesome Holly! I love your color choices and all the wonderful inky details. I love these both! The second one really calls to me! Both cards are fabulous, but I am totally crushing on the second one with your stamped patterned paper! Love it! Awesome work with the awesome new set, the coloring of the background just took my breath away! Both of your cards are just gorgeous. Really like how you used your inks. Very creative. These are both wonderful creations. OMG! What lovely projects and fantastic video! I'm so inspired!!! Thanks for sharing these awesome ideas! Your cards are fabulous! Love the lake scene you did; so adorable. And I love how you stamped your own BG on the 2nd card, fabulous! Love your projects! I can't wait to see even more tomorrow!!! These are great cards with the lake scene and the wonderful scattering of images on the last. Both cards are wonderful, but love the lake scene! Beautiful cards Holly!! I love the scene you created with those cuties in the boat. Both your cards are so pretty. I love the backgrounds on both and I want to go to that lake. Love your video! Great cards, love your coloring! Cute scene you created. Love the background on the 2nd one. Fabulous scene you created and I like the stamped background on the second card. so excited with this release so far!! 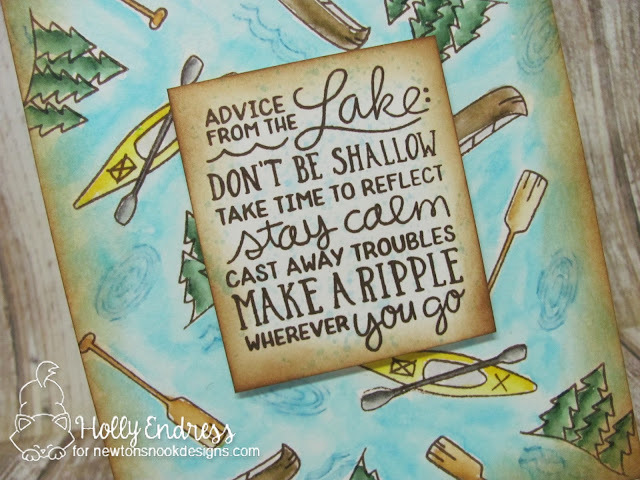 What great advice, indeed - wish I were at the lake enjoying the beauty! Your cards are fantastic! Awesome cards with these fun new sets! Thank you so much for the very informative video! It is always wonderful to gain new knowledge and learn new techniques! To use a stencil to emboss is a technique that will be very useful. You're cards are amazing! Thanks for sharing and inspiring! Fabulous inspiration! Can't wait for these sets! What awesome cards. I just love that large sentiment. That vintage look on your second card is really awesome! Newton's Nook Anniversary Bog Hop!!! YNS 8th Birthday Blog Hop!!! Newton's Nook July Release Day 3!! Newton's July Release and Celebration! 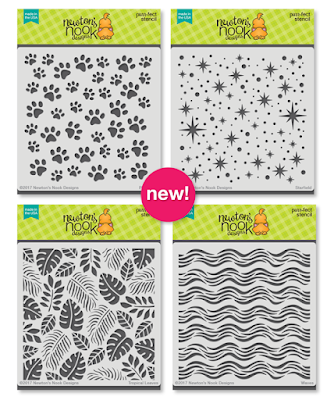 Newton's Nook July Release Day 4!! Newton's July Release Sneaks Day 2! Autism Blog Hop with NND!